It is with the greatest enthusiasm that Something About Kaz is announcing a second iteration of the Dance for Me series! 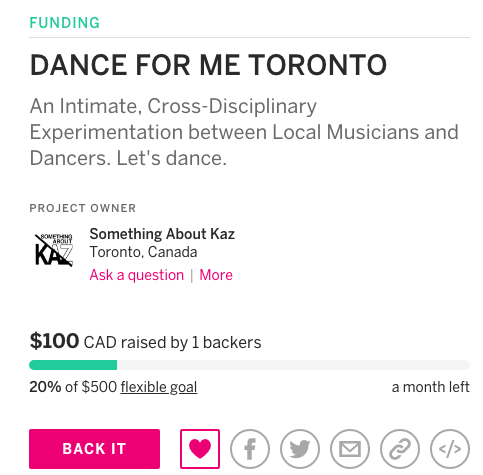 We are in the works of creating DANCE FOR ME TORONTO a new iteration where we explore the intersection of local Toronto dancers and musicians, working in an intimate setting, to produce new content. If it is within your capacity to help support us in order to pay the wonderful artists we are working with, I implore you to go to our IndieGoGo page and make a donation. ANY SIZE of contribution is loved, appreciated and makes a difference! We're back after a 10 hour drive from Baltimore to Toronto. We need to thank the Charm City Festival for having us. We also won an award for this show, after the power in our venue went out and our team was ready to do a 'campfire version' of the show with cell phone lights taped to the wall. We were actually excited to do that, and not many performers would be so flexible and positive. Sydney, Hayden, Marc, El, thank you. Thank you. Thank you. We also have so many people that helped us get here we need to thank. Katherine Sage, Geoff Hayes, Tim Rieck, Madeline Smith, Celeste Tikal, Sheldon Rosen, Lena and John Yost, Irene Sage, John English, Susan McKane, Annie and Bruce Toman, Nick Uffen, Tree of Life studio, Opia Theatre Collective and a few anonymous sponsors. This would have been impossible without all of you. Thank you, thank you, thank you. Now to get some rest and take a break. Until our next project! See you soon folks. We have to thank opia theatre collective for hosting the inaugural dark crop festival. bound to the rocks was welcomed to the festival with open arms, next to amazing talent across ontario. the audience voted, and we won one of two audience choice awards. thank you, thank you, thank you! We'll email you cool stuff! Don't worry. We're busy women. We don't have time to spam your inbox.